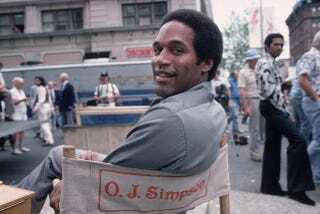 Simpson is used to playing the character he created over the years—the genial O.J. we saw in the broadcasting booth, in TV commercials, and in films—and he seemed ill equipped to play a man tormented by tragedy. His features rearranged themselves constantly. His brow furrowed with worry; his eyebrows rose in disbelief; his eyelashes fluttered, suggesting humility; his eyes grew wide with sincerity. All of this was punctuated by an incongruous, almost girlish giggle. It was Simpson’s will, as much as his talent, that enabled him to become not only a great football player but also one of America’s most beloved black athletes. (“When I was a kid growing up in San Francisco, Willie Mays was the single biggest influence on my life,” Simpson told me. “I saw how he made white people happy. I wanted to be like Willie Mays.”) Over the course of his life, Simpson had gotten virtually everything he has wanted—fame, wealth, adulation, Nicole Brown, and, eventually, acquittal. It was widely reported that Nicole told friends that if her husband ever killed her he’d probably “O.J. his way out of it.” Today, at fifty-three, almost six years after his acquittal, Simpson seems to be free of doubt, shame, or guilt. He refers to the murders of his wife and Ron Goldman, and his subsequent trials for those murders, as “my ordeal.” Now he wants vindication. Only that can erase the stigma that has transformed him from an American hero into a pariah, living out his days in a pathetic mimicry of his former life. And he appears to believe that he will get it, as he got everything—by sheer will—and with it a return to fame and wealth and adulation.